This beef stir-fry with oyster sauce is perfect for a mid-week supper. 1. For the beef, place the fillet in between two sheets of cling film and bash with a meat mallet or rolling pin until half as thin. Slice the beef into thin pieces and place into a bowl, then season with the light soy sauce, oyster sauce, sugar and salt and freshly ground black pepper. Set aside. 2. Heat a wok until smoking and add one tablespoon of the groundnut oil, then add the garlic and chilli. Stir-fry for a few seconds, then add the spinach leaves and toss for a few seconds, until warmed through. Pile onto a large serving plate. 3. Place the wok back on the heat and add the remaining oil, then add the beef slices and stir fry for 2-3 minutes, or until the beef is cooked to your liking. Pour in the Shaoxing rice wine and sprinkle over the dried chilli flakes. Pile the beef over the spinach leaves. 4. For the oyster mushrooms, heat the oil in the wok and add the oyster mushrooms, stir frying for one minute. Add a small splash of water to create some steam to help the mushrooms cook, then season, to taste, with the black rice vinegar and light soy sauce. 5. 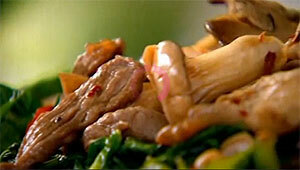 Spoon the oyster mushrooms over the beef and serve. This simple toastie is packed with extra flavour - rich, tangy taleggio melted with mushrooms on toasted sourdough. Quickly pan fry the oyster mushrooms in butter with some torn sage. When cooked add slices of taleggio and melt for a few seconds. 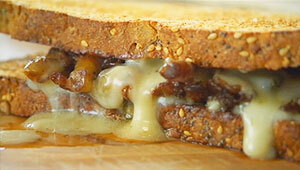 Fill the slices of bread with the mushroom and cheese and serve. 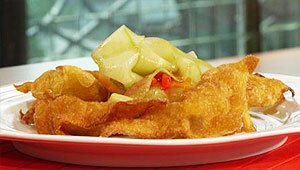 Simon Rimmer shows you how to make homemade wontons with his simple recipe. 1. Heat one tablespoon of the vegetable oil in a frying pan and gently fry the shallot, garlic, chilli, ginger, lemongrass, tofu and mushrooms for 3-4 minutes. Stir in the honey and soy sauce and mix until well combined. 5. For the salad, mix the chilli, soy sauce and lime juice together in a bowl until well combined. Stir in the cucumber, carrot and red pepper. 6. To serve, spoon some salad onto serving plates and top with the wontons.